I require a black ink cartridge only to fit the Lexmark Z730 printer? The Lexmark Z730 printer doesn't accept a black ink cartridge. It uses the Lexmark N1 tri-colour cartridge made up of cyan, magenta and yellow inks to create a process black colour when required to do so. Separate black ink cartridges aren't compatible with the Z730 printer model. Do you want bank account-friendly offers on your ink? For brilliant pricing, plus more, get all your replacement cartridges at Cartridge Save! Cartridge Save specialise in the provision of just the best Lexmark Z730 ink cartridges while ensuring you will get our famed customer care. Hunting for most of the day to find the cheapest ink cartridges is a great way to waste any of your precious time Now you can stop wasting time comparing who has the best offers - the best prices are on our website. So save some time and money - buy with Cartridge Save today. You'll get comprehensive satisfaction when you purchase from Cartridge Save thanks to our rock-solid money-back scheme. In case you have any difficulties printing with your cartridge within 12 month after purchase just post it to us for your total repayment. There's more, everything includes absolutely free next day delivery. You won't have to waste any more hours in the hunt for the best offers - you've already found them at Cartridge Save! The Lexmark Z730 is a desktop printer that uses thermal inkjet print technology. It uses a 3 colour inkjet colour technology and has a maximum duty cycle of 1000 pages. This printer is ideal for home or personal use. The Lexmark Z730 is very cheap yet it delivers good quality output as it has a maximum print resolution of 1200 x 1200 dpi for black and white and 4800 x 1200 dpi for coloured. Print speeds are rather slow. 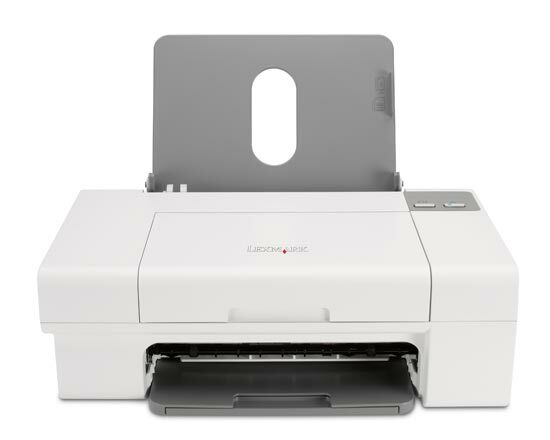 The boxy Lexmark Z730 comes in a neat white colour. It has an extendable input and output tray and the maximum paper handling capacity is 100 sheets. The Lexmark Z-730 weighs 2.3 kg and has dimensions of 152 x 377 x 224 mm. It has a USB port at the back that is compatible with Macintosh and Windows computer. Print speeds can go as fast as 5 ppm for both black and white and coloured prints for normal mode and 13 ppm for draft mode. The Lexmark Z730 compact colour printer is one of the cheapest on the market. For its relatively low price, the qualities of the Lexmark Z730 inkjet printer are extremely good such as the print quality and resolution. The Lexmark Z730 printer uses 3 separate cartridge inks, but running costs are still pretty high. The Z730 colour inkjet could be better with addition of features such as a PictBridge port and memory card reader.